Roxie Randolph is used to breaking barriers. She was one of few female, African-American students majoring in math at Texas Southern University in the 1970s. Later, Randolph found herself in male-dominated fields — in her first job as a computer programmer at NASA and her second as an engineer at Southwestern Bell (now AT&T). After a long career with AT&T, Randolph retired and began volunteering with the Assistance League of St. Louis. She was recently named its president for the 2018-2019 year and became the nonprofit’s first African-American president in its 30-plus-year history. Randolph isn’t surprised it took so long. When she started volunteering with the philanthropic organization in 2013, black members were rare. Now, she said, African-American membership has grown somewhat, but she estimates that only 20 of the organization’s 515 volunteers are people of color. Randolph’s goal is to increase the nonprofit’s exposure to all St. Louisans. 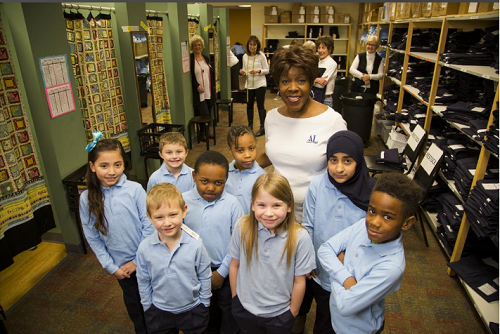 The St. Louis chapter of the national Assistance League operates a variety of community programs, many of which are geared toward helping young students. The league’s signature program, Operation School Bell, provided 7,834 area children with new school uniforms in fiscal 2017. The league, which has no paid staff, spent $1.06 million on program services last year and has a budget of $1.2 million. Yet, Randolph said, many people have never heard of it. Since taking office, Randolph has ramped up marketing with more appearances on local TV and radio stations. To those who knew her when she was growing up in Houston, Randolph’s promotion efforts and leadership might come as a surprise. The middle child of three (a fourth sibling was born 12 years after her), Randolph grew up between two extroverted and high-achieving siblings. Randolph’s mother, who worked various jobs — from packaging airline meals to working at an egg production plant — insisted her children get the college education their parents never had. Randolph liked college so much that after graduating with a bachelor’s degree in mathematics and a minor in physics, she did a year-and-a-half-long fellowship at Oberlin College in Ohio. Then, she went back to Texas Southern to get a master’s degree in math. It was there that she met her husband, an art student. Unsatisfied with her first job as a NASA programmer, Randolph found a better fit as an engineer at Southwestern Bell. Her husband also joined the company, and before long they were both transferred to the headquarters in St. Louis. They planned to move back after a few years, but St. Louis grew on them and they stayed. After more than 20 years with AT&T, Randolph retired and started looking for something to keep her busy. Some women from her exercise class were involved with the Assistance League, and they invited her to an informational coffee session. By the time the session was over, Randolph was hooked. “I was so impressed with what Assistance League was doing, I knew I had to join,” she said. Randolph started out volunteering with Operation School Bell, and later became the program’s chair. Then she became the Assistance League’s vice president of philanthropic programs, and was named president-elect in 2017. Randolph lives in Chesterfield with her husband, Joe. They have one daughter, Essence. What attracted you to the Assistance League? All the programs are good, but when I came in, I was taken by Operation School Bell. That really is our signature program. Operation School Bell is where we bus kids in, and we measure them and dress them — give them uniforms — and each kid gets two pairs of pants and three shirts, and socks and underwear, toothpaste, toothbrush, books, all of those kinds of things. And to see the smiles on their faces, it’s just wonderful. Sometimes they say, “Oh, I get my own toothbrush?” or “See how I look in this shirt!” Because a lot of the kids get hand-me-downs so it’s good to see that you can help in some way, and see that they appreciate it. Are there days when you wish you were getting paid? You know, I’ve never thought about being paid. We kind of joke and say things like “OK, you did so well, I’m gonna give you a raise.” That kind of thing. But knowing that there’s no money involved, it really hasn’t been a problem at all. I think I’m working harder now than I worked in the business world. But it’s not something you think about. What career advice do you have for young people? Know what you want to do, and then go after it. Don’t let anyone tell you it’s something that you can’t do, or it’s not meant for you. You need to try to reach for the stars, and just go for what it is that you’re wanting to do, and don’t let anybody stop you. What’s something no one else knows about you? Very few people might know that I am a performing arts fanatic. Even though I’ve got math and physics backgrounds, I love the other side. I have season tickets to the Fox, and to STAGES, and I enjoy all the performances. It’s so much fun to me. What are your other hobbies? I like going to my Zumba class, and I walk the track at the gym. Recently, I started trying to play pickleball. I’m not any good at it, but I love trying it. It is so much fun. In addition, I love sewing — I’ve made a few outfits for myself — and I love quilting. I’ve made some quilts. I just love being active and doing different things. What are you watching? I love “Project Runway.” That is my favorite. I love to see the creativity of those designers, and I almost always agree with who they’ve chosen as the winner. So it is so much fun. I’m glad the season has started again. What’s your favorite local restaurant? I love Il Bel Lago, and I love Brio. Both of them have good food and good service.